I started cataloging the Digger and Communication Company street sheets as soon as Michael Horowitz donated the first sets of Free City News to us in 1972. I had a ruled accounting journal in the commune where I listed the Com/Co sheets as we got additions to the growing collection. When I put the Digger Archives online in 1993, my dream was to bring the catalog online as well. In 2015, the web provider disabled Microsoft's (now defunct) web management software so the interactive database went away. In the following year, I was able to resurrect this function by re-learning ASP and its tie-ins to ODBC, VBscript, and SQL. So here is the result (also the button "Catalog Listing/Search" on the left-hand margin of this page). An explanation of some of the nomenclature that is used in the database. One issue of the Free City News sheets, distributed in San Francisco, 1967-68. 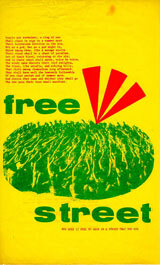 Shown above is the "1% Free" poster that first appeared as wall sized posters in the Winter of 1968 and became a Digger trademark for the last cycle of street events. Various interpretations of the poster's cryptic symbology evolved. One interpretation which gained a certain infamy/popularity was that merchants and rock bands were expected to contribute 1% of their receipts to the Free City Bank to fund various activities such as the Free Food Distribution system.